A mind map is usually a multi-colored diagram displayed on a large sheet of paper, containing words and images that are connected in various ways. The information on a mind map is arranged intuitively according to the importance of the concepts. It organizes ideas and information around a central theme or topic. Additional ideas or concepts radiate in the form of branches from that central theme or topic. The branches are created to represent connections and relationships between portions of information. Branches are a reflection of the way the human brain thinks, creating associations and connection to improve memory. Each branch holds a key word and/or image that are connected to the central theme. Additional ideas radiate from those branches forming a “nodal” structure. 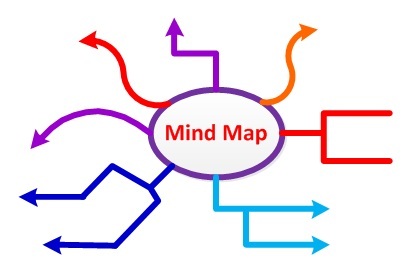 Tony Buzan, the inventor of the Mind Map, asserts that a Mind Map is a powerful graphic technique which provides a universal key to unlock the potential of the brain. He believes it harnesses the full range of cortical skills – word, image, number, logic, rhythm, color and spatial awareness – allowing you the freedom to roam the infinite expanses of your brain. Mind maps can be used as a very effective visual method of taking notes. Mind maps allow for greater creativity when writing down information, as well as allowing the note-taker to associate both words and visual images with concepts. The mind map flow allows the note-taker to write down information where it best connects to the other topics, versus the traditional linear way which forces the note-taker to record information in a linear sequential way. Mind maps approach and visual design also helps to enhance ideas and increase mental retention through the use of colors and symbols. The maps have a multi-branch format, with secondary ideas branching off the main idea into sub-sections. A mind map will have key topic lines radiating in all directions from the main topic, with sub-topics and facts branching out from them. The visual design is similar to the way limbs, branches, and twigs extend from the trunk of a tree. Use just key words or simple phrases. Put key words and main ideas on lines, in boxes, or in circles. This reinforces the structure of connections. Print rather than write in script. It makes them more readable and memorable. Joined writing can be more difficult to read. Use different sizes and styles of lettering because the size and style of the letters provide insight into the importance and meaning of the word. Use symbols and images as much as you can. Pictures can aid memory more effectively than words. Vary the thickness and length of the lines used to connect ideas and concepts. Provide as many visual cues as you can to emphasize important points. Use multiple colors to separate ideas, group concepts, associate themes, and to aid in visual stimulation. Use arrows, lines, or other cross links to show connection between different sections. Information in one part of the Mind Map may relate to another part. Cross-links help to see how one part of the subject affects another. Think multi-dimensional. Add a new dimension by drawing boxes around the word or image to add depth. Enclose some branches of a Mind Map with circles or boxes to delineate importance. Use your imagination and be creative. Creativity aids memory. Allow your thoughts to come freely.